When summer weather turns cool as autumn nears, I begin to rely more heavily on the soups and stews that nourish my family through the long, cold and dark days. Last autumn, I leaned more heavily on bean soups not only for their humble and old-fashioned simplicity, but also for their low cost and ability to extend otherwise expensive grass-fed meats that we pack into our freezer as we can. I begin each of my bean and lentil soups the same way. First, I pick over the lentils and rinse them well to remove stray clumps of dirt and little stones that disguise themselves as beans. I dump the beans into a big bowl, and cover them with hot water to allow them to soak and soften at least overnight and up to a day. Soaking beans in the old-fashioned recipe results in two improvements: one culinary, and the other nutritional. Soaking beans softens them, allowing them cook more quickly, more evenly and with tender results. Soaking beans also improves the bioavailability of trace minerals such as iron, magnesium, phosphorus, zinc contained in beans. Keeping the soaking water warm to hot helps to ensure that antinutrients that otherwise bind up these micronutrients, making them difficult to fully absorb, are deactivated. Beans are also an excellent source of folate, a B vitamin that is critical for women of reproductive age for its ability to support reproductive health and in the prevention of neural tube defects. Bone broth is a cornerstone of our diet, and of my family’s daily meals. Its flavor soothes, while it also helps to support systemic wellness. Broth is rich in both trace minerals, and in gelatin – which helps to support digestive system health and skin health. Marrow beans are plump white beans about the size of your pinky fingernail. An heirloom bean, they can be difficult to find in many grocery stores, but they’re creamy texture and unique flavor that tastes lightly of bacon, and despite their rarity, they’re worth finding. I order my marrow beans online, about 10 pounds at a time and keep them in the pantry. Simple and humble, this Marrow Bean and Pale Vegetable soup takes advantage of some of the most charming vegetables of autumn: plump and crisp potatoes, celeriac and parsley root. Dump the marrow beans into a large mixing bowl, cover them with hot water by 2 inches and stir in a pinch of baking soda. Cover the bowl and let them soak for at least 18 and up to 24 hours. 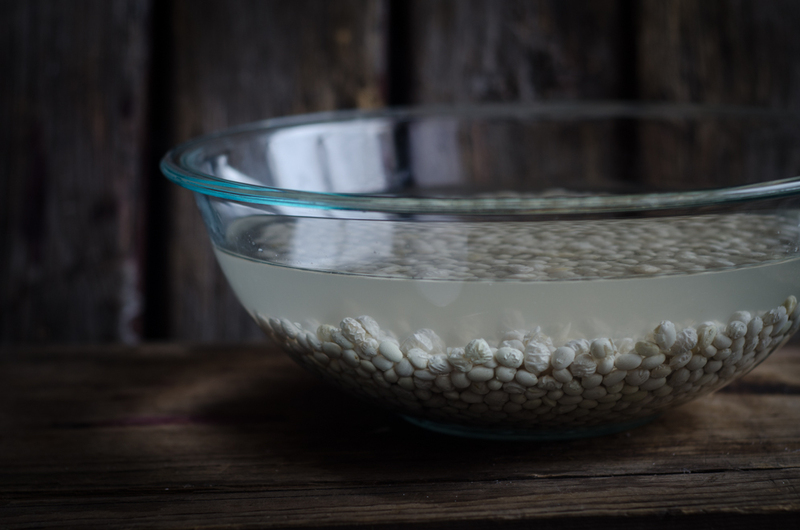 Once or twice as the beans soak, drain away the soaking water and replenish it with hot water. After they've soaked at least 18 and up to 24 hours, strain the beans and set them on the countertop for later. Discard the soaking water. In a heavy stock pot (like this one), melt the ghee. Stir in the leeks and garlic, sauteing them until softened and fragrant - about 4 minutes. Pour the stock into the pot, and stir in the soaked beans. Simmer, covered, for 1 hour. 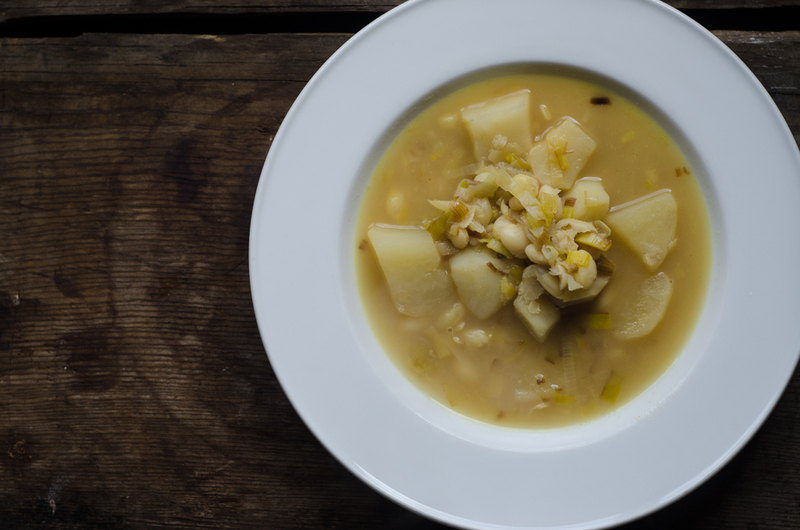 Stir in the celeriac, parsley root and potatoes and continue simmering the soup a further 30 to 45 minutes or until the beans and vegetables turn tender and yield when pierced by a fork. Ladle into soup bowls, and serve hot. If you cannot find marrow beans, ( check online), or substitute navy beans or cannellini beans. If you cannot find parsley root, substitute additional celery root. I tried to e-mail you off-site but your message said to use this method. The 2nd paragraph below is missing a few words about why you use the hot water. Soaking beans in the old-fashioned recipe results in two improvements: one culinary, and the other nutritional. Soaking beans softens them, allowing them cook more quickly, more evenly and with tender results. Soaking beans also improves the bioavailability of trace minerals such as iron, magnesium, phosophorus, zinc contained in beans. Keeping the soaking water warm to hot helps to ensure that antinutrients that otherwise bind up these micronutrients, making them difficult to fully absorb. Beans are also an excellent source of folate, a B vitamin that is critical for women of reproductive soup for its ability to support reproductive health and in the prevention of neural tube defects. This sounds great but with shipping the beans are almost $40.00! That is too harsh on my budget, though I think I’d be in favor of any bean that tastes like BACON! Yum! That raises the price of the meal considerably! Any bean that tastes like bacon is alright in my book, so I’m curious and I want to try this recipe. I’ll definitely have to make room for these marrow beans in my budget. You can also get them online through North Bay Trading Company, a family-owned biz in northern Wisconsin.